Thousands of supporters bid an emotional adieu to Manohar Parrikar at Marimar Beach on Monday evening, where late Goa CM's last rites were performed with full state honours. 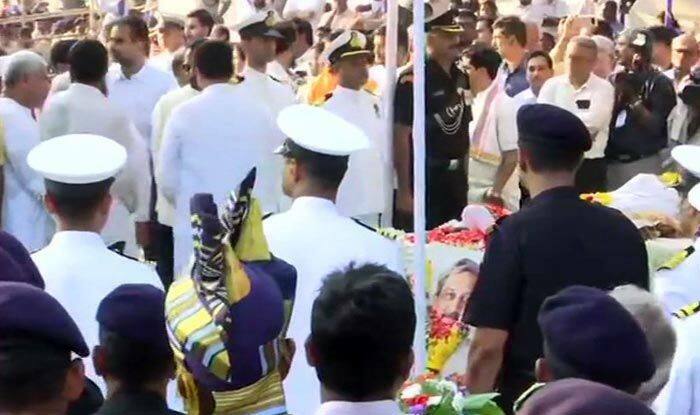 New Delhi: The funeral rites of Goa Chief Minister Manohar Parrikar were held on Monday evening at Marimar Beach with full military and state honours, and thousands of supporters bidding the affable politician an emotional adieu. The mortal remains of Parrikar, wrapped in the national tri-colour, were placed on a pyre amid a 21 gun salute at the beach and his elder son Utpal Parrikar consigned it to flames. BJP president Amit Shah, some Union ministers and chief ministers of BJP-ruled states were amongst others to attend the funeral at Miramar. Notably, the late Goa Chief Minister, aged 63, died at his private residence in Panaji on Sunday evening after a prolonged battle with pancreatic cancer. He even credited the surgical strikes conducted by Indian Army in Pakistan-occupied Kashmir during his tenure as Defence Minister to the teachings of the RSS. His plunge into BJP politics is considered as an attempt by the party to curb the growth of the state’s oldest regional political party’ Maharashtrawadi Gomantak Party (MGP)’. Parrikar entered electoral politics in 1994 when he won on a BJP ticket from Panaji constituency.